and spring was the theme. and teachers were cutting and gluing bulletin board paper 'till all hours at night! This was serious ya'll: lunches from a restaurant were the prizes for the winning door. the awesomeness that bloomed up and down our hallways. for their Specials classes: PE, Art, Library and Music. Miss Ladybug's smile reads "Don't bug me, I'm in Specials!" because they appear to flutter in and out. Did you notice the ladybug antenas are punctuated with red balloons? had a blast putting this door decoration up. It's cute! Slinkies and clocks "Spring Forward." Get it? Those fourth grade teachers are so funny. Here you see a vivid rainbow made from little kids' hands that they traced and cut out from paper. The rainbow arches over a field of bugs and flowers. Adorable! Placed third in the contest. There's a lot of work on this door. cotton balls for noses and chenille stems for whiskers. Drenched in details and impressive! and I don't know where to begin describing this really beautiful double door decoration! 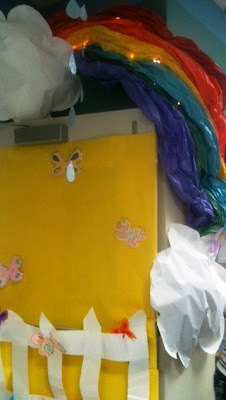 a picket fence with flowers, puffy paper clouds, and a paper rainbow with lights inside. Awesome! 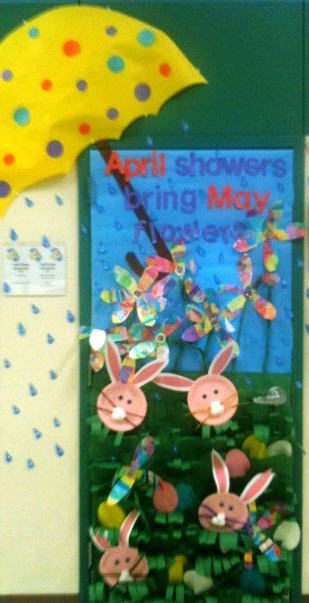 Much more was added to this display like a paper tree and swing. Incredibly cheerful! Placed second in the contest. a dimensional rainbow made from colored paper twisted into paper ropes. Don't miss the glittery raindrops, puffy clouds and sun. Mary Poppins too! and make a point for your favorite basketball team in the basketball finals. 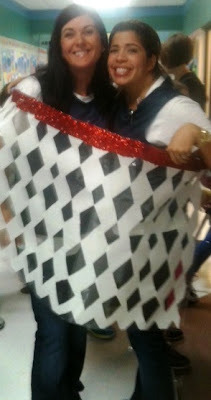 Third grade teachers Jenia and Aly are "hoopin' it up" to music. They're wearing basketball jerseys with the number "3" on the back to represent their grade level. They're about to hang the paper hoop around a hula-hoop and put it up over their doors. This door scored! It took first place in the teacher door decor contest. 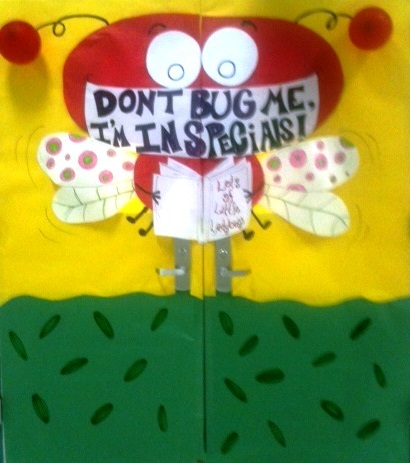 ~Cheryl Gee cut and glued ladybug body parts to decorate a door this week. She is happy to share this story of the door decorating contest at school with you and her friends at the Glue It Art Challenge at Artsyville and Mary Walker Design's Show Me What You Got Wednesdays.